Delete Cinema-Plus from browsers if you have discovered this suspicious extension running without your permission. The application may have been created with good intentions; however, it is now used as a platform for online advertisers. According to researchers in our internal lab, the application has been designed using the Crossrider engine. It is infamously related to Browser_Apps, PalMall, SuperIntext, and other advertisement-supported programs. Note that if you learn how to remove Cinema-Plus, you should have no trouble with the removal of other Crossrider applications either. 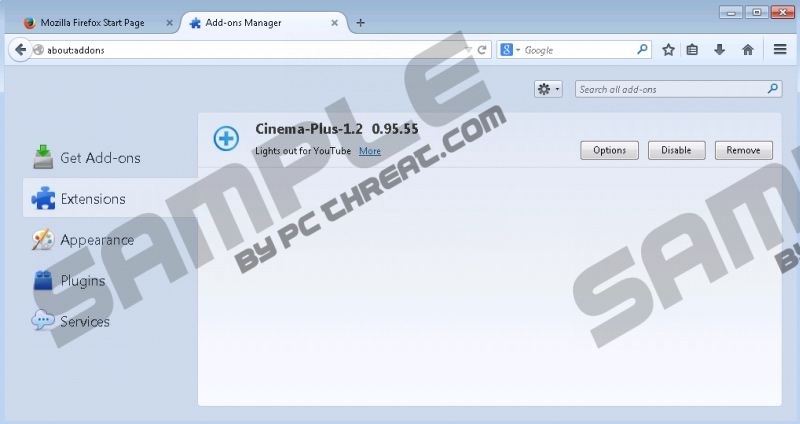 Cinema-Plus does not have an official website representing its services; however, it is possible to download this program form crossrider.com/download/0060548. Of course, we do not recommend installing the application at all because it is not as advantageous as you may think. Instead of the promised services, you should expect Cinema-Plus to enable the avalanche of third-party ads. Interstitial, pop-up and banner advertisements, freeware installers, and various coupons may show up luring you into using the promoted services. It is best to delete Cinema-Plus right now because sooner or later one of the promoted ads may seem too good to pass up. In the best case scenario, you could be introduced to authentic services, and in the worst case scenario, you could face the complicated malware removal. Not many advertisement-supported applications are reputable and can be trusted. Therefore, if you face the activity of adware, you should investigate it without wasting any time. According to the researchers analyzing suspicious computer applications and virtual security threats, adware is often created by parties who are untrustworthy. These parties need a platform to promote sponsored links, and adware provides just that. Of course, there is no better indication that you should delete Cinema-Plus than its suspicious activity. If the promised services turn out to be useless, you should remove the application right away. If the app came bundled with other software, you should delete it as well. Are you opposed to installing reliable security software? This software is necessary if you do not know how to delete Cinema-Plus and the associated software manually, and if virtual security is important to you. You can employ the manual removal guides below; however, you need to recognize that your virtual security will remain vulnerable unless you reinforce it using appropriate tools created for that. Use SpyHunter if you want reliable and up-to-date services. Move to the left of the Task Bar and click the Start menu button. Select Control Panel to access a new menu and double-click Add or Remove Programs. Click the undesirable application and Remove it (in the Change or Remove Programs menu). Open the Start menu by clicking the Windows button on the Task Bar. Select Control Panel to find more options and then click Uninstall a program. In the Metro UI menu right-click anywhere on the background and select All apps. Open the Control Panel and then click Uninstall a program. Locate the unwanted application you wish to delete, right-click it and select Uninstall. Quick & tested solution for Cinema-Plus removal.